Be the first to share your favorite memory, photo or story of James Roy. This memorial page is dedicated for family, friends and future generations to celebrate the life of their loved one. 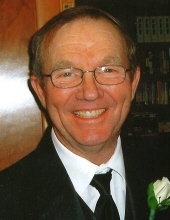 James Roy Voigts, age 72 of Belmont, WI, passed away Monday, April 15, 2019 at Southwest Health Center in Platteville. He was born on December 7, 1946 the eldest son of Roy and Loretta (Sornberger) Voigts. Jim grew up on the ancestral Voigts Family Farm on Mitchell Hollow Road outside of Belmont. He graduated from Belmont High School in 1965 and went on to complete the Farmer’s Short Course in Madison. Jim and his dad raised Holsteins, beef and pigs, and he was a member of the Mound View 4-H Club. On March 16, 1974, Jim married Jean Carns. Together they farmed with Jim’s parents, and were awarded the Outstanding Young Farmer award. They were blessed with four children who helped around the farm and were in 4-H. After Jim moved into Belmont, he worked at Lactalis Cheese Plant. Jim was a faithful member of Westview Methodist Church in Platteville, where he held various offices and volunteered on a mission work team in Guatemala. He was also an active member of the Belmont Lions Club, serving as President and spending many hours keeping the Belmont Mound Park in good shape. Jim loved the Lord, people, and enjoyed to joke and tease. He regularly participated in the Belmont Men’s Prayer Breakfast and helped prepare the food for many years. In his free time, Jim enjoyed farming, fishing, gardening, biking, cooking, and spending time with his grandkids. Jim is survived by his wife of 45 years, Jean; four children: Joe (Melissa) Voigts, Jill (Michael) Forrest, Janet (Eric) Thurler, Janell Voigts; seven grandchildren: Jonathan, Natasha and Thomas Forrest, Lilli Thurler, and Abigal, Savannah and Issac Voigts; two step grandchildren: Paige and Kelsey; two step-great-grandchildren: Athena and Adaei; four siblings: Jean (Ron) DeBuhr, Karen McArdle, Larry (Kim) Voigts, and Ron Voigts; and many nieces and nephews. In addition to his parents, Jim was preceded in death by a brother-in-law, Bill McArdle. Funeral services will be held at 11:00 a.m. on Saturday, April 20, 2019 at the Westview Methodist Church in Platteville with Pastor Paul Glendenning officiating. Burial will be in the Belmont Cemetery. Family and friends may call on Friday, April 19, 2019 from 3:00 p.m. until 7: 00 p.m. at Westview Methodist Church in Platteville, and on Saturday, April 20, 2019 from 10:00 a.m. until the time of service at the church. In lieu of plants and flowers, a James Roy Voigts Memorial Fund has been established. The Martin Schwartz Funeral Home & Crematory of Platteville is entrusted with his services. The family would like to thank the nurses and staff at Southwest Health Center and Agrace Hospice in Platteville for the care and kindness they provided throughout Jim’s illness. To plant a tree in memory of James Roy Voigts, please visit our Tribute Store. "Email Address" would like to share the life celebration of James Roy Voigts. Click on the "link" to go to share a favorite memory or leave a condolence message for the family.